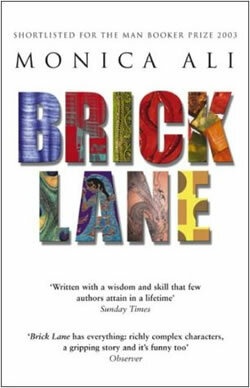 At first glance, you may think that Brick Lane is full of unsatisfied and unhappy characters. Luckily, the book itself was a far from an unsatisfactory read. In fact, by the end, I was very satisfied indeed. The characters may be frustrated with certain aspects of their lives, but this book shows how people can rise above their disappointments and live their lives to the full. Our heroine is Nazneen, who grew up in a small village in Bangladesh. After her sister runs away in a ‘love marriage’ and her mother passes away, she is sent to London to marry an older man. She is only eighteen when this life changing decision is made by her father, and nothing will ever be the same again. Ali describes Nazneen’s transition from village life to life in London perfectly. Although the new flat feels like a luxury (there is actually a flushing toilet!) Nazneen feels trapped and unsure of how to act around her new husband, Chanu. At first, I was prepared to really dislike Chanu, with his corns and his big belly and annoying speeches about the ‘ignorant’ and ‘uneducated’. I soon realised that Chanu was just an unhappy man, unsatisfied with his job and disappointed with all his failed dreams. He is a fair husband and kind in his way. Time passes and Nazneen settles into her life in London; having Dr Azad round for dinner, meeting her friend Razia for the latest gossip, putting up with the dreaded Mrs. Islam and of course her brief meetings with Karim, the young and hopeful Bengal Tiger. This book is full of brilliant and colourful characters and I often found myself laughing at their different quirks and habits. Nazneen also receives letters from her sister in far off Dhaka. There are often quite large sections of these letters, which at first I found frustrating to read because of the terrible grammar. However, I did soon get used to Hasina’s way of writing, and it is interesting to see the contrast between her life in Dhaka and Nazneen’s life in London. It is heartbreaking to know that a whole continent separates them. Brick Lane touches on important issues, such as racism, extremism, immigration and the lack of identity in the Islamic youth. However, the book is not only about lost dreams and dissatisfaction, it’s about family and community. I find the most moving scenes in the book are with Nazneen, Chanu and their family. Although the book isn’t cheery and there is no massive sweep of good luck, it is heart warming and by the end, a book filled with hope. If you’d like to buy the book, click the picture below. Yes, it is an ideal choice for a book club. You can have endless discussions! I’m glad you enjoyed it!